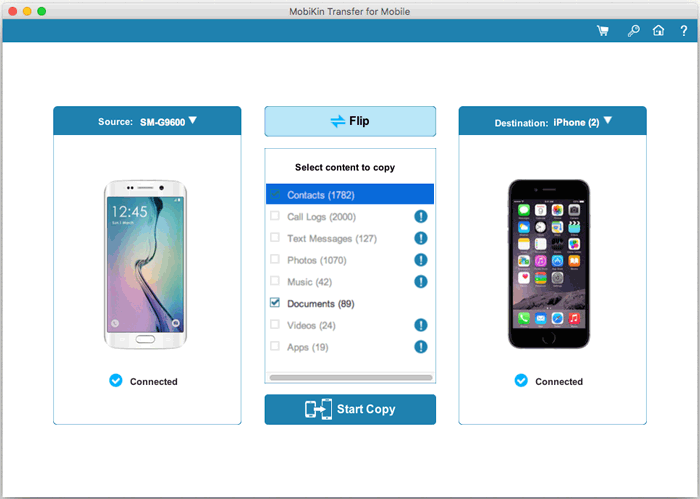 After releasing Transfer for Mobile (Windows Version), MobiKin, which offers the best software for Android and iOS users, announces that MobiKin Transfer for Mobile (Mac Version) is available last week. For Mac users, Transfer for Mobile helps them to transfer data from one phone to another one directly, including contacts, call logs, text messages, media files and more. Let us have a look about this awesome software. 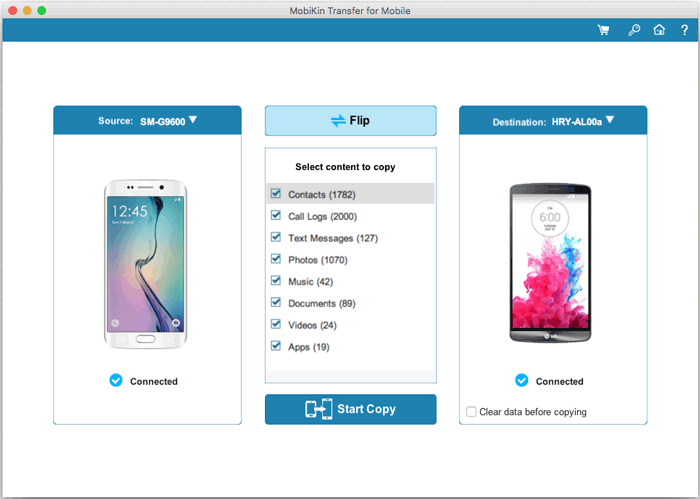 MobiKin Transfer for Mobile (Mac Version) allows Mac users to transfer contacts, call logs, SMS, photos, music, videos, apps, and documents from Android to Android with ease. Before the data transferring, you can also clear data on your target Android phone if needed. And the you can change the positions of two phones by clicking once to perform data transferring in a reverse direction. When you need to sync Android data to iPhone/iPad/iPod, MobiKin Transfer for Mobile (Mac Version) works perfectly on moving contacts and books (ePub & PDF formats). Especially, for those who switch from Android to iPhone, Transfer for Mobile is the first choice to help sync thousands pieces of contacts with one click. When it comes to transfer files from iPhone/iPad/iPod to Android, more files are supported. It allows Mac users to move contacts, SMS, music, videos, photos and books (ePub & PDF formats). With it, you can transfer iPod music to your Android phone without hassle. In addition, when switching to a new Android phone, you do not need to worry about leaving important data on old iPhone. 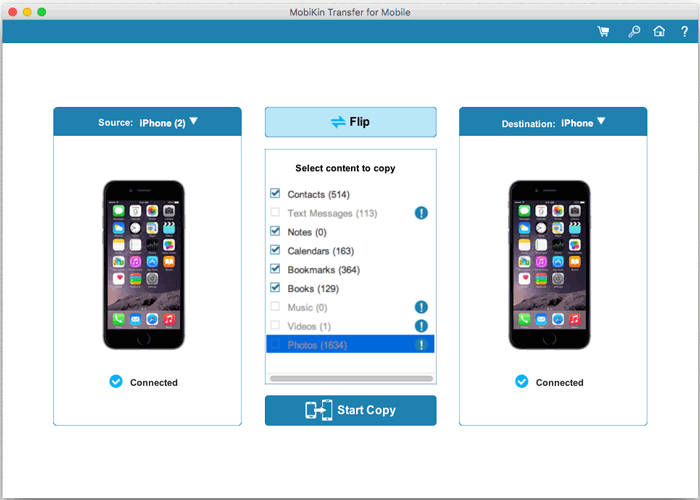 MobiKin Transfer for Mobile also serves for Mac users to transfer files between their iOS devices without iCloud. The supported files in this mode include contacts, calendars, bookmarks, books (ePub & PDF formats), and notes. The software can be a good assistant to save iCloud space by switching files between iPhone and iPad/iPod directly. The data that you choose to transfer can keep its original quality on both the source and target devices. No technical background required, every Mac user can follow his feel to transfer files from phone to phone within 3 steps: connection -> select data -> start to transfer. – Works smoothly on Mac OS X 10.7 or later. – Support almost all Android phone on the market, including the newest Samsung Galaxy S10 Plus/S10/S10e. – Support iPhone/iPad/iPod which is running iOS 5.0 and above (iOS 12 included), including iPhone XS Max/XS/XR/8 Plus and more. What do you think about MobiKin Transfer for Mobile? Leave your comments below!